Carl Froch represents everything that fans typically admire in a boxer. He can fight, he can punch, he can take a hell of shot, he can brawl, he is not afraid to let his hands go, and his fights are usually of a very entertaining variety. Additionally, he is a proven warrior who consistently challenges himself against the very best in the world. He is, quite literally, ready to fight anyone anywhere. The Cobra is also an extremely dedicated and incredibly well conditioned athlete. Most importantly perhaps, however, he always gives it absolutely everything he has. All of this was on full display when Froch defeated Mikkel Kessler by unanimous decision, reversing the outcome from their first bout three years ago when Kessler beat Froch in Group Stage 2 of the Super Six Boxing Classic. Just like last time, Kessler and Froch once again both put on an amazing show, with each combatant exhibiting good punching power, a solid chin, and tremendous courage amid heated back and forth action. Froch steadily outworked Kessler over the long haul and was able to control a lot of the activity with his effective rangy jab. Carl and Mikkel have now won one apiece, each man holding a victory on his home turf, and each man having once traveled to the other’s backyard. Interestingly enough, backyards are often a favorite topic of discussion for certain fans when it comes to Andre Ward. Ward’s detractors often criticize him for never fighting outside the US and traveling to someone else’s backyard. Regardless, Ward has done his business in such dominant fashion that he has left no doubts regarding his extraordinary abilities. Andre is universally recognized as the best super middleweights in the world, and he is also widely viewed as one of the elite pound-for-pound talents in all of professional boxing, on par with Floyd Mayweather Junior. Ward already holds impressive victories against Froch and Kessler, having outclassed both of them during the course of the Super Six. But now that Froch has strung together a trio of impressive victories since losing to Ward in the Super Six Final, some observers are interested in seeing a Ward-Froch rematch. While a rematch does seem possible, and perhaps even likely, it does appear that whether or not the fight is staged in the UK could be what makes or breaks a potential deal. Whether or not Andre Ward “leaves his backyard” could possibly become the focal point of any future negotiation between him and The Cobra. Froch supporters will argue that Carl is more exciting to watch and that he traveled to the US for their last fight, so the rematch should be in the UK. Ward fans will counter that Andre is the undisputed king of the division and that he does not need to travel since he already soundly defeated Froch. Neutral fans, on the other hand, might not particularly care about this fight much at all. The reality is that even though Froch avenged one loss against Kessler, the prospects of him also doing so against Ward seem very unlikely. Of course this is boxing, a sport where anything and everything can, and does, happen. Froch is an outstanding fighter so he would certainly have a chance. But how much of a chance? The perception is that Carl simply cannot do anything differently that would lead him to be much more successful against Ward in a return bout. Andre already thoroughly outclassed Froch, and there is good reason to believe a rematch would unfold similarly. Froch may have once again now solidified himself as the second best super middleweight in the world, but the talent gap between him and Ward along with the chemistry of the way their styles match up make this a tricky sell, especially for those desiring a greater degree of doubt concerning the outcome. Ordinarily, boxing fans would always want to see the two best guys in a division square off, but Froch and Ward’s first meeting severely impairs the aspect of uncertainty. The beauty of the Froch-Kessler rematch was that its interest stemmed from their highly competitive engagement first time around, and blossomed with the two paths each man had taken since last they met. This created an intriguing “unknown element”—something that simply does not exist for a Ward-Froch rematch, but always had for Froch-Kessler. Too much is “known” about a Ward-Froch clash. The most compelling challenge out there for Froch, and one that definitely exudes strong vibes in the mystery of the “unknown”, is a match-up against ageless warrior, Bernard Hopkins. The 48 year old is coming off an impressive win against Tavoris Cloud, where the crafty veteran outclassed the undefeated champion in every single facet of their fight. Hopkins still has the skills and abilities to take advantage of some of Froch’s flaws that were visible in the Kessler rematch. Froch sometimes tends to throw his punches a bit too wide, and is oftentimes somewhat reckless with his attacks, which occasionally leaves him vulnerable, off-balance, and out of position. These types of mistakes made by Froch are the exact type that someone like Hopkins is quick to exploit, and has in fact made a career out of exploiting. With his amazing ring IQ and his knack for setting traps and adapting, Bernard could wind up being a complete nightmare for The Cobra. On the flipside, however, Froch has a very high work rate, good boxing skills, excellent stamina, and the ability to apply consistent pressure. These are all attributes that could help Froch possibly do well and succeed against the old master craftsman. Mystery and uncertainty exist, and that makes it an interesting prospect. At this stage right now, Froch-Hopkins is one of the best fights that can be made in the 168-175 pound range. Given their strong personalities, it should also even prove to have an interesting build-up as well. 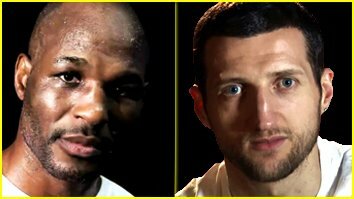 Hopkins and Froch simply have the type of styles that should inherently bring the best out of each other, where each fighter is capable of removing the other from his comfort zone. All of the ingredients are in place here for a potential super fight. It will give Froch the opportunity to beat an age-defying legend, and it will afford Hopkins the chance to beat a champion who personifies everything that is good about boxing. Of course Froch has other options besides Hopkins and Ward, and it looks like Hopkins would have to take care of other business first in July. But this is still a match-up that can generate a lot of excitement in boxing, and it would inevitably be a great treat for fans worldwide. Next boxing news: What Next For Carl Froch? You are here: Home / Boxing News / Forget a Ward-Froch Rematch! Bring on Hopkins-Froch!